Bob Goldberg has had an action-packed year. 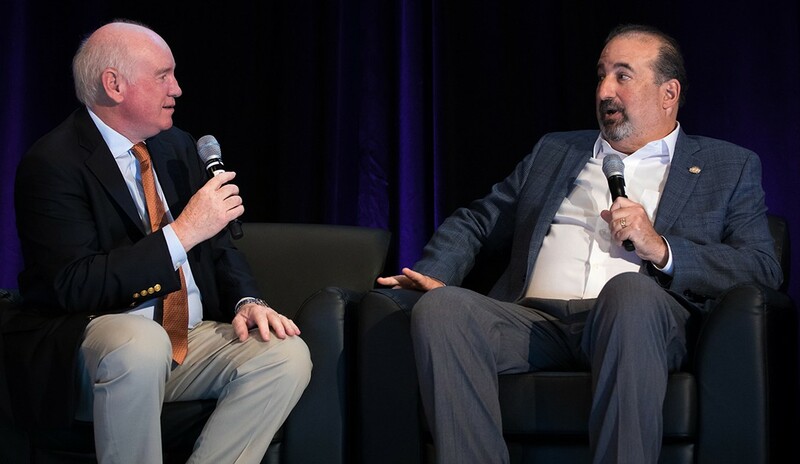 In just a little more than 12 months since taking the helm as CEO of the National Association of REALTORS®, Goldberg has implemented an array of internal changes and spearheaded several key initiatives designed to better serve members. During a special one-on-one interview during RISMedia’s CEO Exchange at the Harvard Club of New York on Sept. 5 and 6, Goldberg sat down with RISMedia President and CEO John Featherston for a behind-the-scenes look at some of the progress that’s been made at NAR in the past year, and some of the obstacles he confronted along the way. John Featherston: What are some of the biggest challenges you’ve faced since you’ve taken on the CEO role at NAR? Bob Goldberg: We too went through a rebranding (Goldberg’s interview followed the CEO Exchange panel discussion, “The Rebranding Challenge: Fit for the Future While Preserving Your Roots”). NAR is a $5 billion brand—one of the top 20 most-recognized brands in the U.S. We hired one of the leading firms in the country, and went through consumer research and member panels for a year and a half. For other brands, a rebranding is about how do you get member engagement. For us, it was more about the identity of who our members are. Our logo hadn’t been updated in more than 40 years. So, one of our biggest challenges is change. Our challenge at NAR is how do we invoke the change? Professionalism is also another challenge in our industry. I can’t tell you how many people ask me, ‘What are you going to do to stop the high number of members in the association?’ But NAR has never recruited or brought in one member. That happens at the broker level. Financial security is another challenge for our members. Thirty percent of members don’t own a home. Advocacy is another challenge. We are one of the two most powerful PACs in Washington. Technology is yet another challenge—NAR is playing a key role in driving and bringing technology into the industry. BG: I had literally been the new CEO for two and a half weeks when we got slammed with tax reform. The administration had just lost the battle on health care and was determined to force through tax reform. There was a cap for the deduction on capital gains, and the elimination of SALT would’ve meant folks in higher taxed states would’ve seen a substantial increase in taxes. We fought and fought, and the end result was positive. JF: What role will NAR play in Washington moving forward? BG: Washington is a different animal today. We’re naming a new chief lobbyist very shortly. We are going to name someone who can make inroads in both the House and the Senate, and also at the White House. We haven’t had great results in the White House in over 10 years. We participated in the DOJ and FTC panel discussions, but we don’t really lobby them. With our new lobbying efforts, we will be able to move the needle in all of those areas. JF: What’s one of the goals on your agenda for the year ahead? BG: We are working on an Association healthcare program. We’ve been pushing for that even before President Obama. We’ve been lobbying that associations and independent contractors should be able to be in a national pool for a healthcare platform. Now, the administration and Department of Labor is in favor of this. However, it’s not the great panacea everyone thinks it is. The way the Department of Labor has outlined it, if you’re a national organization, you can only pool with someone in the exact profession that you’re in, so that means we can’t even pool with the Homebuilder’s association. However, local and regional associations are allowed to bond together in regional coalitions, so regional programs will likely be a better option. JF: We just returned from your iOi (Innovation, Opportunity and Investment Summit) in San Francisco. Tell us about what else you’re doing in terms of technology. BG: There’s always discussion of disruptors and innovators. There are disruptors outside our vertical trying to take it over and there are innovators within. Our position is, whatever you want to call them, they are coming rapidly with billions of dollars of capital investment. We expanded Second Century Ventures to bring those technologies into our industry, so they’re advocates for us. We created a Strategic Innovation area to help them work with organized real estate. Many companies work within our REACH incubator so we can help them be successful and work within our industry. Whether we’re in it or not, we want to grow the tent and bring them in. The sky is not falling, but it will if we don’t invite them in.